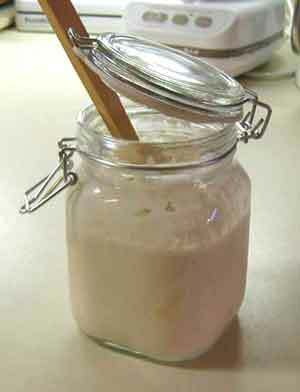 Here's what I use to keep my sourdough starter stash in the fridge. The reason I like this jar in particular is that I can leave the lid loose while all the critters in the jar are feasting on their meal of flour and water--but it's attached so I don't misplace it. Then, when everybody has finished dining, cooled down and has settled down for a nice long nap, I can seal it up tightly so that even if it gets knocked over, it won't spill. More important, really, is that nobody will throw out my starter! For a very short time, I kept my starter stash in the fridge in one of those 'disposable' leftover containers, until one day it got thrown away by a well-meaning but misguided member of the Fridge Police. I'll NEVER do that again! These glass jars are much better than a porcelain crock, because you can see what's going on inside the jar. You can tell when you need to give your critters a meal. Plus, the jars look good, and I like that too. The good news is that this is a high quality glass jar and I can sell it for only $9.99. The bad news is that it's a high quality glass jar and it weighs a lot so shipping costs $10 if you order it by itself. If you see some other things that you need, however, then just go to my Make Your Own Kit page and find out how to get what you want without paying an arm and a leg for shipping charges.